You’ve finally booked your Adventure Kayak Tour or Rental and now it’s time to get out on the beautiful waters of Sarasota’s Lido Key. Now what do you need to have a fun and rewarding kayak trip? The truth is not too much! Nature provides the beauty. And we take care of the safety equipment. You need to bring your sense of adventure and fun. Of course you want to be protected against the elements. In Florida of course you want to protect yourself from the sun. So it’s a good idea to bring sunscreen so you don’t get sunburnt. It’s also a good idea to wear a hat. A hat will not only protect you from the sun, but it’s a helpful aid in providing shade to see in the water better. So when your helpful guide points out local wildlife such as manatees or dolphins you are able to see them better. A pair of polarized sunglasses will help protect your eyes from the sun and aid in seeing wildlife in the water as well. Kayaking is relaxing, but when the weather is warm, it’s a good idea to bring along some water to keep hydrated. You could also bring along a snack too. Just be sure to take any trash with you when your tour is over. Your kayak tour is sure to be memorable so you want to be sure to capture the moment on camera, whether that be by a camera or a smart phone. Just be aware that it could get wet, so either have protection for it in case it gets splashed or we encounter a passing shower. We provide instructions and comfortable life vests, so you really need to bring along your sense of adventure and be ready to have a long lasting fun memory of your trip! Book your kayak tour here! Spring Break is right around the corner. It’s a great time to head down to Sarasota, visit the beautiful Siesta Key Beach, hang out with friends and go on a kayak tour! What better way to relax with nature, take a much needed break from school while hanging out with friends, than on a kayak tour? You can see the light at the end of the tunnel, school is almost done for the semester and it’s time to refresh. 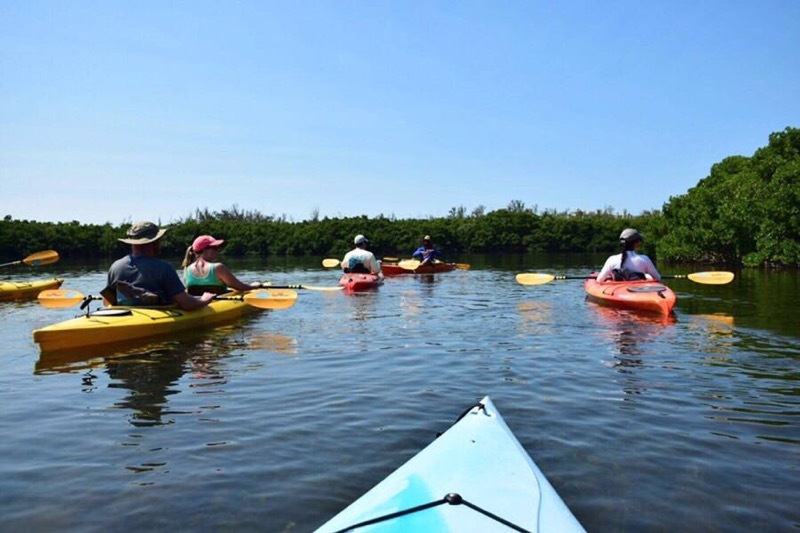 A kayak tour on beautiful Lido Key nestled in the Gulf of Mexico in Sarasota, close to Siesta Key Beach is just what you need to relax and have some much needed fun. Grab a bunch of your closest friends for an adventure filled trip you won’t soon forget! Your kayak tour will get you up close and personal with some beautiful wildlife. We typically see bottle-nosed dolphins. They call our area home due to the warm shallow waters. We also see manatee, they love the sea grass we have in addition to the shallow water. We have plenty of exotic birds including pelicans, herons, egrets, hawks, egrets and roseate spoonbills. You can also see turtles and sting rays, as well as many different types of fish jumping about. We can’t control the wildlife we see, but these are some of what you can see on a typical day out. Our journey into the exotic mangrove tunnels is a whole other experience. It’s quiet and serene, it’s shaded too. The mangroves are home to crabs and sea stars. The mangroves have different paths which lead you into the sun-filled grass flats of brushy bayou and Big Grass Lagoon. 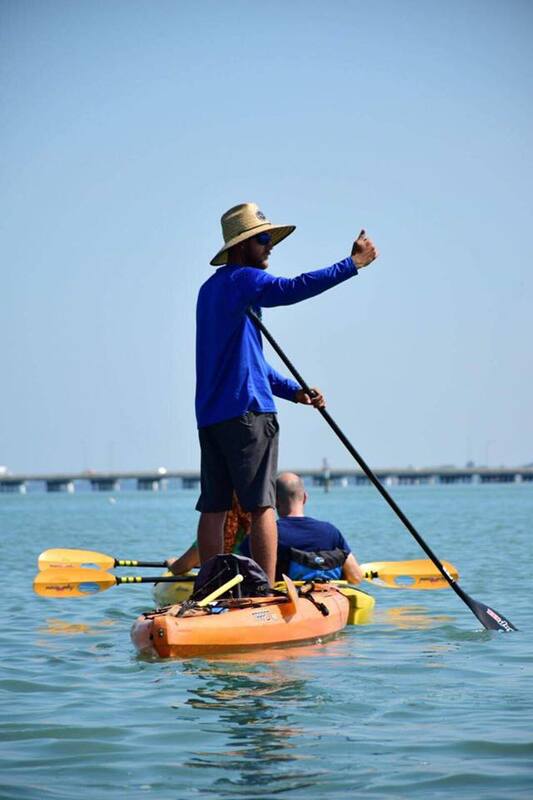 Come and discover an eco kayak tour into the shallow protected waters of Lido Keys, a unique experience during your Spring Break, one you won’t soon forget. Book your tour today! As much as we love kayaking, spring is in the air in Sarasota. And guess what that means? Spring Training is back in town! Now’s a great time to get up close and personal with your favorite players and catch a training practice or even a game while some of your favorite teams are here! The Baltimore Orioles train right here in Sarasota. Their first home game is on Saturday, February 23rd and they host the Minnesota Twins. They play at Ed Smith Stadium. Here’s a complete list of their 2019 Spring Training Schedule. The Pittsburgh Pirates play right next door in Bradenton, and Garth Brooks is even in town this week, as an added bonus! Their 2019 Spring Training schedule begins with their home opener at Lecom Park against the Miami Marlins on Sunday, February 24th. Here is their complete Spring Training Schedule. The Tampa Bay Rays play in Port Charlotte which is a bit south of Sarasota. Their games are played at the Charlotte Sports Park. Their home opener is on Friday, February 22nd against the Philadelphia Phillies and is the kick off game for Spring Training! See their complete schedule here! If you’re open to a bit of a drive, catch the New York Yankees in action in Tampa at Steinbrenner Field. Their home opener is Monday, February 25th against the Toronto Blue Jays. Their Spring Training Schedule is here. And if you’re really up for a drive, catch the current World Series Champions Red Sox at their Spring Training Facility located in Fort Myers at JetBlue Park at Fenway South. They open their Spring Training Schedule hosting the New York Yankees on Saturday, February 22nd! Their complete Spring Training Schedule is here. It’s time to play ball! One of Sarasota’s best kept secrets is Ted Sperling Park on Lido Key. It’s located on the southern tip of Lido Key, and the park provides many unique opportunities for nature lovers to explore both on land and by kayak. And if you’re looking to see dolphins and manatees, look no further, you’ve found your perfect spot! 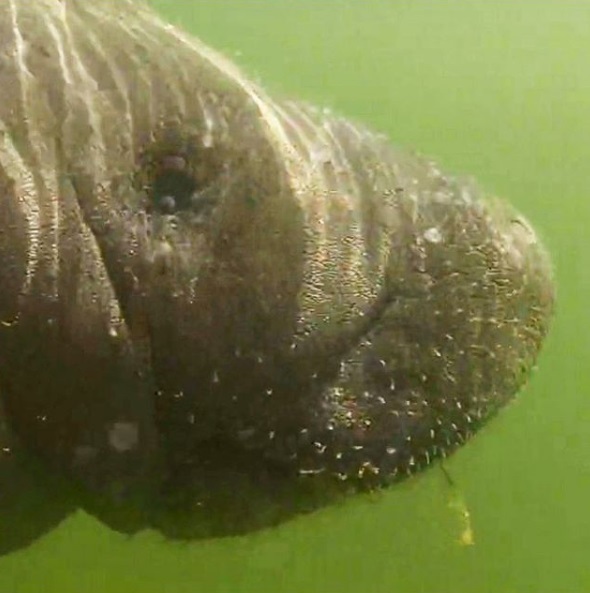 Sometimes, some of the best places to see manatees aren’t very publicized. That’s the case with Lido Key. Locals and tourists alike have discovered that this area is well liked by manatees due to its shallow grassy waters. If you’re out on a kayak tour, you can usually spot them. And these manatees definitely have no qualms about swimming right up to your kayak, they’re so used to seeing them at this quiet location. Adventure Kayak Outfitters launch location on Lido Key is perfect for kayakers looking for adventure. Not only does it have the exotic mangrove tunnels offering a few different paths to explore. But it also has many picturesque views and of course many different types of native wildlife, both aquatic and airborne. Ted Sperling Park isn’t only home to manatees, but also native dolphins. They are often seen frolicking about, and they too aren’t shy. Many times they seem to be putting on a show for us or will follow our kayaks around for a bit. They’re so much fun to watch playing around in the water! When you take a kayak tour with our experienced native guides, they can help to point out both dolphins and manatees, and take you to the spots you’re most likely to see them. While we can’t control nature, we usually do see them on our tours. It’s best to keep your eyes peeled and not miss anything. Our tours will definitely provide a memory to last a lifetime! There’s always something to do here in Sarasota. Why not try something other than laying on one of our beautiful beaches? Get out and explore our beautiful area in a way that you can’t by any means other than kayaking. Check out these 8 reasons everyone should go kayaking. It’s a great way to connect with nature. Our launch location on Lido Key is nature at its finest. You can encounter so many different types of wildlife, while exploring a beautiful ecosystem. Kayaking is a wonderful way to explore new places. There’s no other way to explore the exotic mangrove tunnels of Lido Key than by kayak. They’re quite the sight to see. It’s a great escape from the sun, and they’re a place many different sea creatures call home. Kayaking is the perfect way to connect with friends, family, and to meet new friends! What better place to bond than on the water! The most beautiful memories can be made on the water. Kayaking is also a wonderful way to exercise. Not only is it a cardio vascular exercise, but you’re also working just about every muscle in the body! Connecting with nature is the perfect way to release stress. Between the beautiful gulf views, the calm bay waters, the sounds of the native birds, and the paddles dipping in the water, the whole experience is serene. It’s a great escape! Kayaking can be done by just about everyone. Whether you bring young children along for the ride in a tandem kayak, or older ones out on their own, people of all ages can enjoy a kayak trip. The nice thing about kayaking is that it is easy to learn. Our expert guides teach even beginners how to kayak, and you’re outfitted with safe kayaks, as well as life jackets. Getting to a kayak is easy. If you don’t own one, you can rent one, or go on a tour. We can even drop one off to you! Bottom line, kayaking is just plain old fun! Just about everyone can do it, and it can be done alone or with a group. It’s the perfect outdoor activity! Adventure Kayak Outfitters offers tours, rentals and group tours. Book your adventure online today and save $5.00. Located just minutes away from Siesta Key and St. Armand’s Circle is beautiful secluded Lido Key. There you’ll find beautiful gulf views, native wildlife (including bottle nosed dolphins and manatees, and an exotic mangrove forest). It’s close enough to all the action yet far enough away to feel like you’re in your own little slice of paradise. 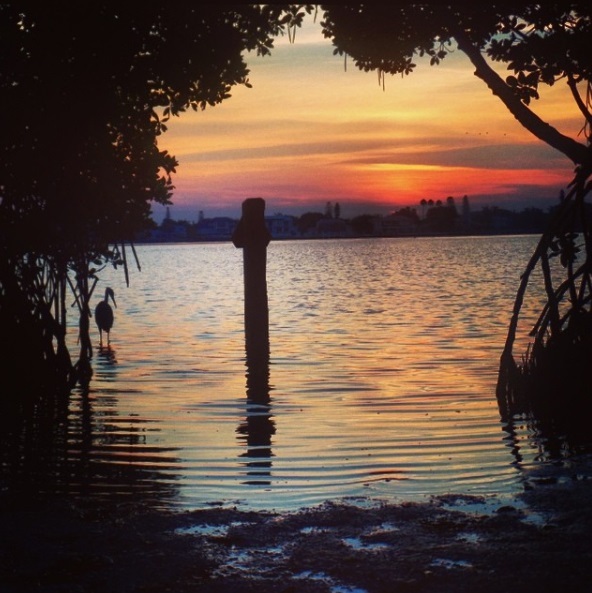 These mangrove tunnels are a popular spot for an exotic adventure in Sarasota bay. Mangroves are so important to Florida’s ecosystem, not only do they serve as nurseries for many types of fish and oysters, crabs and shrimp, but they are also rookeries for many different species of birds. Their root system also helps to prevent erosion and protect Florida’s shoreline. They’re a very important tree. Lido Key is a great place to spot dolphins and manatees before entering the tunnels. When in the tunnels it’s fun to observe the different ocean life such as starfish, jelly fish, different sponges, as well as plenty of horse shoe crabs and shells. There are usually plenty of crabs climbing along the mangroves too. Kayaking the mangrove tunnels is always a magical adventure. It’s usually nice and quiet, but for the sounds of nature, and the sounds of paddles in the water. The mangroves provide shade, so it’s also a cool relief from the summer sun. The light is filtered and provides magical views of the wildlife both above and below the water. Fun fact: Many of these “mangrove tunnels” were once man made ditches which were dug years ago as a way to control mosquitos. This didn’t work, and eventually they turned into mangrove arbors. Other mangrove tunnels grew naturally due to the tides ebbing and flowing. When maintained well, they provide a unique way for eco outfitters such as Adventure Kayak Outfitters to provide not only an enjoyable time on the water, but an adventure through a beautiful ecosystem as well! Book your tour today! Kayaking involves a bit more than hopping on the kayak and paddling away into the ocean view. When you go on a tour with Adventure Kayak Outfitters, your tour guide will give you instructions, so even the most inexperienced kayaker will be able to paddle with ease. But it’s always a good idea to have a few safety tips, especially if you’re renting a kayak and aren’t on a tour. It’s important to keep an eye on the weather. It’s never a good idea to go out on the water in a kayak when there’s a small craft advisory, or if there’s bad weather coming in. Typically here in Sarasota, Florida, the weather is warm. You’ll want to dress for summer weather, meaning shorts and tee shirts. It can even be a good idea to wear a SPF sun shirt to protect from sun burns. The mangroves do provide sun protection, but it is very important to wear a hat, sunglasses and sunblock. These items will not only help protect from sunburns, but polarized sunglasses will help you to see sea creatures in the water a bit more easily. Just like swimming, always use the buddy system when kayaking. Don’t go out on the water alone. Not only is it important to bring a PFD (Personal Floatation Device), but bring a whistle or horn, as well as something that can reflect the sun, such as mirror. Sarasota Florida is one of the best area’s to go kayaking. The shallow protected waters of Lido Key, coupled with the exotic mangrove tunnels provide many homes to the areas ecosystem. The chances of encountering manatees or bottlenose dolphins in these shallow waters are pretty good! Our kayak launch location on Lido Key in Sarasota is just minutes from Siesta Key, Longboat Key, Anna Maria Island, Bradenton, Lakewood Ranch, and Venice. Book your tour today! February is an exciting month full of events in Sarasota! 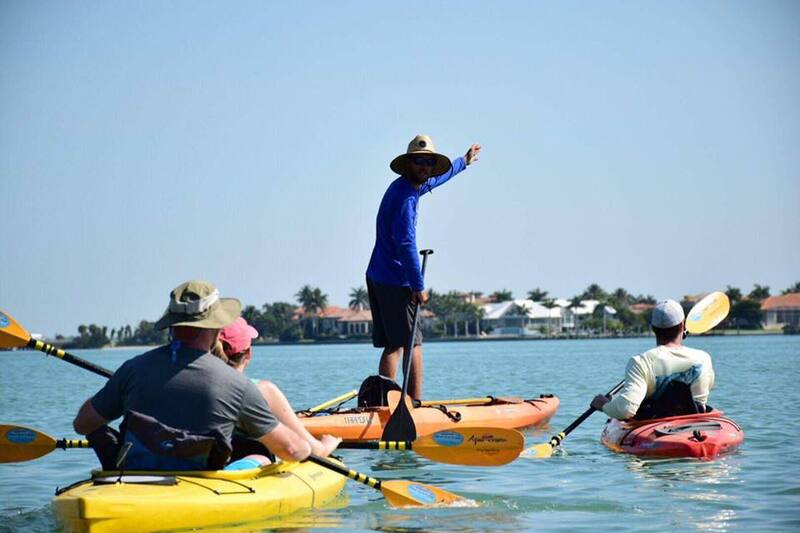 After you’ve enjoyed yourself kayaking on the beautiful waters of Lido Key, explore the island with these fun things to do! The Sarasota Ski-A-Rees are back for another exciting season with their water ski team! Free shows take place on Sunday’s at 2pm. The Sarasota Ski-A-Rees a non-profit organization. Membership in the organization is open to youth interested in learning about and developing skills related to water skiing and water safety, and to adults who desire to educate, coach and supervise these youth. The 30th Annual Downtown Sarasota Festival of the Arts takes place Saturday February 10th and Sunday February 11th from 10am -5pm on Main St. in Sarasota, FL. Admission to this outdoor art show is free! Sunshine Artist Magazine consistently ranks this as one of the top 100 Fine Art Shows and is one of the area’s biggest and best art events. Meet some of the best artists in the nation, displaying life-size sculptures, spectacular paintings, one-of-a-kind jewels, photography and more. Thunder by the Bay is rolling back into Sarasota from February 15-18. This event continues to honor veterans, active duty military and first responders at this 2 day festival. It is full of events around Fruitville, the Sarasota Fair Grounds, and Main Street. This year, there is also full service camping available at the Sarasota Fair Grounds. From a wide variety of live music, to bike shows, food vendors, and block parties, there is plenty to do all weekend long! Check out the schedule of events here. Don’t miss the 24th Annual Siesta Key Craft Festival on Saturday February 24th and Sunday February 265th from 10am -5pm on Ocean Blvd in Sarasota, FL. Take in the sand and sea as you discover beautiful creations from over 100 crafters exhibiting and selling their work in this outdoor gallery which is sure to be a spectacular festival! You’ve booked your kayak tour on beautiful Lido Key, and now you’re probably wondering what you should wear, and what to bring with you. Don’t worry, we’ve got you covered. Always bring a hat. Wearing a hat can help protect your head, eyes and face from getting sun burned. Wearing a hat can also help make some of the sea life we encounter easier to see without the sun glaring in your eyes. Sunglasses, especially ones with polarized lenses will make it easier for you to see in the water. They’ll also protect your eyes from the sun as well as the glares off the water. Bring sunblock and chap stick. It doesn’t matter if it’s hot or even sunny, the sun is strong, and you want to protect yourself from getting sunburned. Wear comfortable clothing that you don’t mind getting wet. You will be stepping in the water to hop into your kayak, and who knows, you might even want to jump out onto the sandy beach area too. Bring water. You want to keep yourself hydrated. There are so many different types of sea life we can encounter, you’ll be sure to want to snap a photo of your adventures. Either just use your cell phone, or bring a camera. We can’t guarantee that they won’t get wet, so it’s up to your discretion. Bring a snack that’s easy to eat. Wear shoes that you don’t mind getting wet; either sandals or water shoes are perfect. Most importantly, bring your sense of adventure! At Adventure Kayak Outfitters, we provide stable kayaks, clean and comfortable life vests, as well as expert local guides who love what they do! Bring whatever will make your Sarasota kayak tour most comfortable and enjoyable for you. The beautiful scenery will create memories to last a life time. To find out more, and to schedule your kayak tour click here. We love what we do, and love that our clients can see our enthusiasm. We got this review in our inbox and thought it would be great to share it! We didn’t have reservations but lucked into it being a quiet morning (Florida kids just returned to school I think) and Dan being available to take us on a great tour of Sarasota Bay near St. Armands/Lido area. He was not only fun, but gave us great info about the bay, its plant and sealife and much more. We lucked out that day and not only saw 2-3 manatees up close (they came to us) at the entrance of one of the inlets that goes through Lido key near St Armands but also a 25 min display of dolphins “sharking” a school of fish. Dan made sure we kept far enough back to not disturb the manatees or dolphins but had a running commentary on what was going on and was just as excited as we were. My parents have lived full time in Sarasota for 30 years and just moved to a retirement community near St. Armands and I’ve never had such fun on the water. Please tell Dan how much we enjoyed his interesting and informative tour and hope to see him again on future visits to do more kayaking. That day is one of those “We’ll remember this the rest of our lives” times! Kayaking is a great way to get up close and personal to some of nature’s most beautiful creatures and locations. We are lucky here in Sarasota Bay to have dolphins, manatees, as well as beautiful native birds and gorgeous landscape. See some of our other reviews on Trip Advisor and Facebook. To schedule a kayak tour, visit us online and save $5.oo.